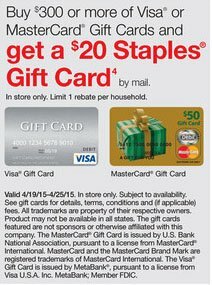 Through Saturday, August 29, Officemax is having an unadvertised special where you get a $15 rebate when you buy $300 worth of Visa gift cards. I made a whopping 24,000 miles during a promotion just like this one around Christmas by driving around to different OM stores. By buying 3X$200 gift cards you will get an instant $30 discount off the total automatically. The gift cards each have a $6.95 fee so your total for all $600 in gift cards will just be $590.85 [(3X$206.95) – $30]! This means you are getting $10 for free! But wait… There’s more! If you use a normal miles earning credit card you will score 591 miles or points, but if you use the Chase Ink Plus card (which gives you 5X points on Office Supply stores like OM) you will take home almost 3,000 of the ultra valuable Ultimate Rewards points. You can usually do this once per day at every OfficeMax in your local area (if they aren’t sold out of course). 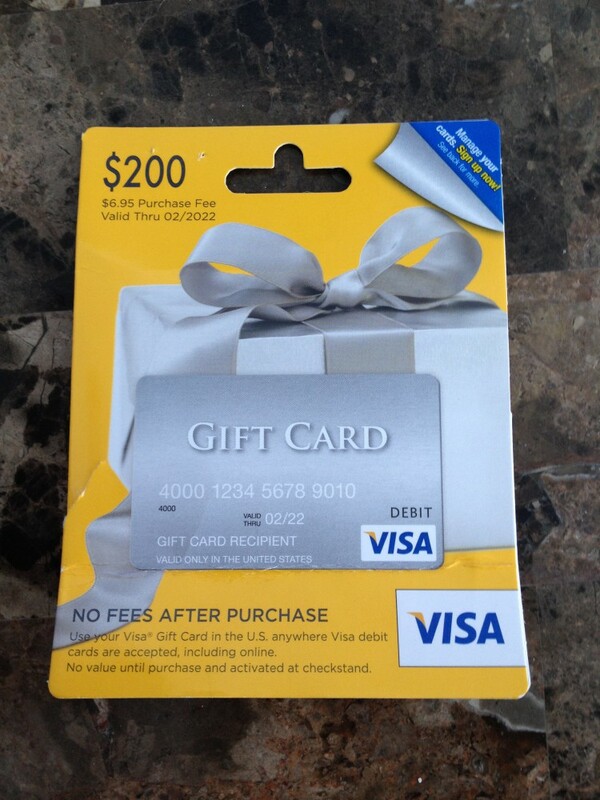 Note this works for the $200 and $100 gift cards but the $200 are a better value since the fee is approximately the same. Keep in mind that even though they are merged, this promotion is only at OfficeMax stores not Office Depots. You can also call before you go to make sure they have the $200 Visa’s in stock so you don’t waste a trip. Make money and miles… Does it get any better? Chase Ink Plus bumps bonus to 70,000 points! Update 10/23/14: The bonus has gone back to the normal amount of 50,000. The Chase Ink Bold card has long been one of my favorite cards that has made me hundreds of thousands of Ultimate Rewards points. The Chase Ink Plus is its cousin that is a credit card (that allows you to pay over time) instead of a charge card like the Ink Bold (that requires you to pay in full each month). 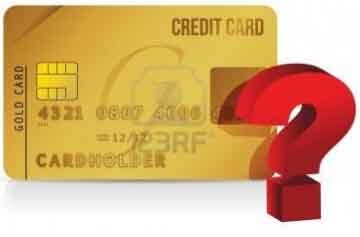 Although you should be paying in full each month with either card to be a responsible cardholder! If you are paying interest you are doing the miles game all wrong! This is a business card so you will need some sort of a small business to apply such as buying and selling things on ebay or a consulting business or anything you do on the side to earn extra money! 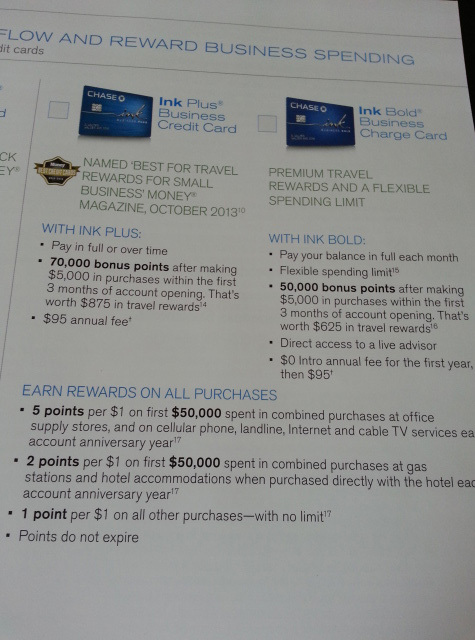 Author John ButlerPosted on October 6, 2014 October 24, 2014 Categories Chase Ink Plus, Chase Ultimate Rewards2 Comments on Chase Ink Plus bumps bonus to 70,000 points! Book Fast! 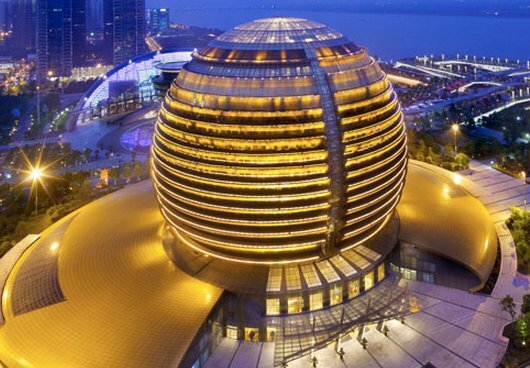 8 Amazing Pointbreaks Hotels for 5,000 Points til 9/30! Author John ButlerPosted on July 27, 2014 August 11, 2014 Categories Chase IHG Rewards, Chase Ink Plus, Chase Sapphire Preferred, Chase Ultimate Rewards, IHG Rewards ClubLeave a comment on Book Fast! 8 Amazing Pointbreaks Hotels for 5,000 Points til 9/30! Chase has made a 70,000 point offer for the Chase Ink Plus business card available in their branches. As of right now this isn’t available online. You have to spend $5K in the first 3 months to get the bonus. This is the credit version of the Chase Ink Bold charge card. I have made hundreds of thousands of miles from my Chase Ink Bold card with the 5X points bonus it gives you for Office Supply stores. Thanks Cyin on FT for the pic! This is the best offer I have seen for these cards since they originally came out, so if you were thinking about getting one, then now would be a good time. Note that you will have to pay the annual fee on this one, but the $95 is worth it for the extra 20K Points over the standard 50K offer.